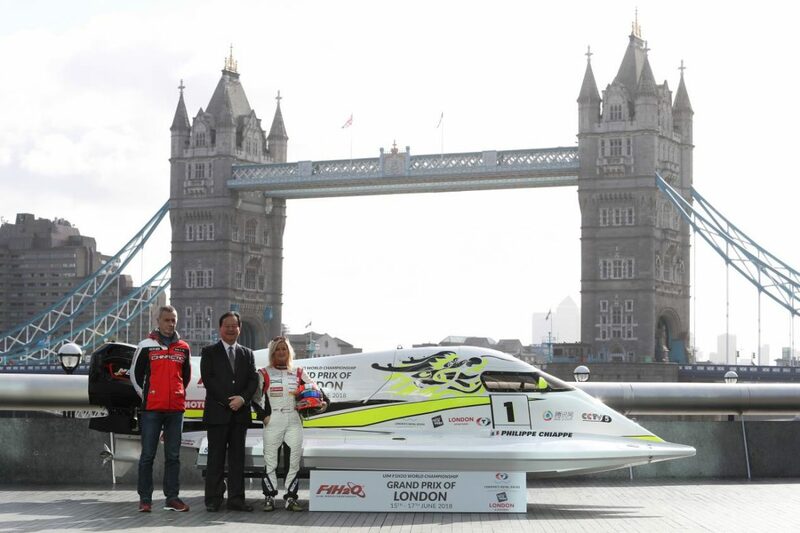 The British leg of the flagship series of single-seater inshore circuit Formula 1 powerboat racing – the UIM F1H2O World Championship Grand Prix of London – was today launched in the heart of London. A photo call and press conference were held for the world’s media in the shadow of London’s iconic Tower Bridge. Those involved. included: Marit Stromoy (NOR), the Emirates Racing Team driver and the first woman to ever win a Formula 1 powerboat Grand Prix; Philippe Chiappe (FRA), CTIC F1 Powerboat China Team driver and three-time world champion; Mr. Li Haojie, UIM F1 Committee member and Chairman of Tian Rong Sports, the local promoter of the Grand Prix of London in association with H2O Racing; Jules Chappell OBE, Managing Director, Business at London & Partners, the Mayor of London’s official agency promoting London internationally as a leading world city in which to invest, work, study and visit; Nicolo di San Germano, President of H2O Racing, the promoter of the UIM F1H2O World Championship; and Joanna Jones, Commercial Director of London Tech Week, Europe’s largest festival of technology and innovation. The UIM F1H2O World Championship Grand Prix of London will be staged at Royal Victoria Dock from Friday 15 until Sunday 17 June 2018. On Friday the F1H2O powerboats will have a free practice session. On Saturday qualifying will see the 10 F1H2O teams battling the clock and vying for pole position. While on Sunday afternoon racing will get underway following an hour’s free practice session and a parade lap. General tickets and VIP tickets (which include a range of hospitality packages) are available for the UIM F1H2O World Championship Grand Prix of London. For further information, general enquiries about the UIM F1H2O World Championship Grand Prix of London, and details of how your business can be part of the UIM F1H2O World Championship Grand Prix of London please visit www.f1h2o.co.uk. Alternatively, you can contact Mark Thomas atF1H2OLondonService@hotmail.com. The UIM F1H2O World Championship Grand Prix of London will be part of the headline event programme at this year’s London Tech Week, Europe’s largest festival of technology and innovation, with a range of events held across the city from 11-17 June 2018.